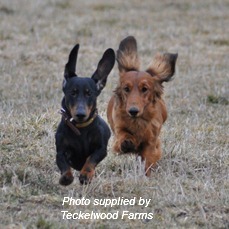 ...dachshunds are very social animals and some will become very distressed when confined with no company. It is advisable to start training early by leaving your dachshund for a very short time just a few minutes and slowly increase the time, but only as your dog learns to cope. If you use a dog crate you can move his crate to a different room to give a change of scene, while you are away, when you return talk calmly as though it is no big deal being left. A chewing problem can develop if your dog gets bored as you do not spend quality time with him, on activities, training, grooming, cuddling and talking. Walks and exercising through a variety of different environments, fun, games and play, try to give him a good work out before leaving him in his crate or inside the house, especially if you are leaving him alone. All puppies love to chew especially when they feel the discomfort of cutting new teeth, which is fine depending on what they are chewing, so act before a problem arises. To help with this problem use a herbal remedy like PetAlive PupTeeth which relieves the discomfort so reducing the need to chew. Settles puppy and helps develop strong teeth and bones. Also provide a number of suitable interactive toys for your puppy, there are a large variety to choose from some can be filled with treats and it takes the dog a long time to access the food. Rotate play toys and introduce new ones occasionally. Never give your puppy items such as old shoes, items of old clothing, books, paper etc to play with as this will encourage bad habits and may lead to a dog chewing problem. Be aware of leaving items lying around particularly on the floor, food packets, remotes,socks, hats, clothing etc. Ensure all leads and cords are out of reach, as these can be a real safety hazard. Repair or replace any worn or frayed carpet or rugs as this is a real temptation. Use anti chew products to make fixed items that are at low level unattractive to your dog, to chew, so bad habits don’t start. Establish good habits early and this will go a long way to solving a dog chewing problem before it starts. 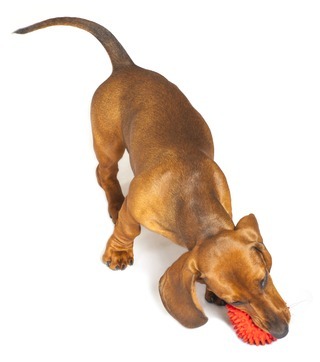 If you do catch your dog in the act, offer him a chew toy and praise him when he takes the toy in his mouth. Remember ignore the bad behavior and praise the good behavior.